1475 Seabay Rd, Weston, FL.| MLS# A10602889 | Susan J Penn l Best Agent l Buy & Sell South Florida Homes! Take a look at this beautiful one story that is nestled in Hibiscus Island consisting of only 116 homes! 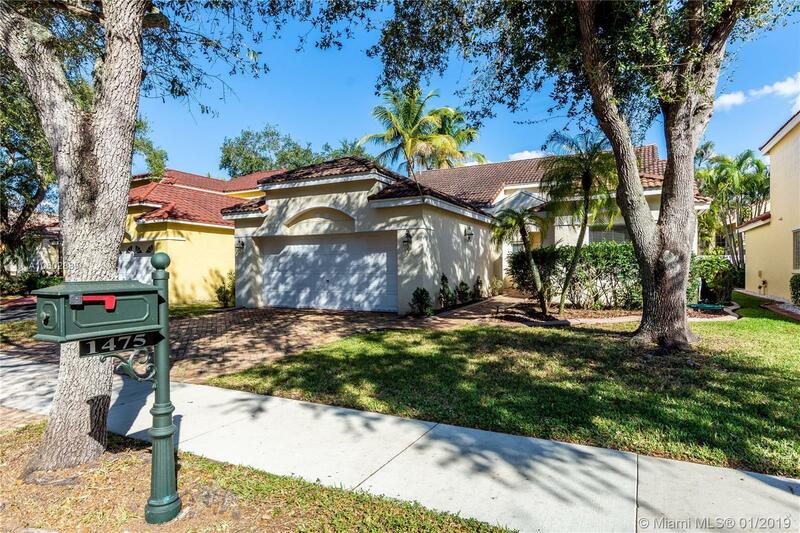 Here in Weston's perfectly placed, gated neighborhood, you will find canopied, tree lined streets, a welcoming pool & playground, & THIS 3 bedroom, 2 bath gem complete with impact windows. This bright sun-kissed home welcomes you the minute you walk in with it's vaulted ceilings and open concept living. Plenty of granite counter space, breakfast bar & solid wood cabinets make this kitchen a dream! The split bedroom floorplan offers just the right amount of privacy. The master bedroom is generous in size w/ a walk in closet, master bath w/ double vanity, & separate large shower & garden tub. The outside is complemented w/ a Chicago brick courtyard entry & a screened in porch for dining. Directions: Indian Trace To Tequesta Trace Rd. Right Onto Suncrest Drive, Left Onto Seabay Road. The House Will Be On Your Left.